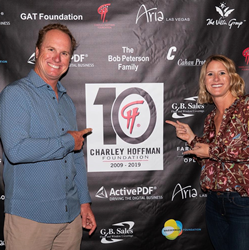 ActivePDF, the leading provider of PDF automation tools and digital transformation solutions, recently partnered with sponsored PGA TOUR Winner Charley Hoffman for the 10-year anniversary of the Charley Hoffman Foundation. ActivePDF is a proud sponsor of Charley Hoffman and a major donor to the Charley Hoffman Foundation and their many philanthropic events. Founded in 2009 by Charley Hoffman and his wife Stacy, the Charley Hoffman Foundation raises funds and awareness for charities benefiting children in their native and adopted hometowns of San Diego and Las Vegas. The mission of the Foundation is to help raise money and awareness for children’s organizations that provide a positive environment to better their future through education, sports, and health. The 2019 Charley Hoffman Foundation Auction and Pro-Am began with a live auction and party on January 20, at The Belly Up Tavern in Solana Beach, featuring performances by Kelley James and Don Felder, formerly of the Eagles. Among the many items auctioned at the event were ActivePDF’s donations of golf and dinner with Anaheim Ducks Captain Ryan Getzlaf, premium seats to an upcoming Anaheim Ducks game at Honda Center, and official NHL autographed items. The event continued on January 21, at the Charley Hoffman Foundation Pro-Am at Torrey Pines North Course for an exciting day of golf with professional golfers, food, drinks, gift packages, and a personal golf clinic held by Hoffman. Celebrity golfers included Rickie Fowler, Xander Schauffele, Adam Scott, Gary Woodland, and more. The 2019 Charley Hoffman Foundation Auction and Pro-Am raised a record-breaking $500K+ benefiting Pro Kids Golf Academy, Cystic Fibrosis Foundation, and San Diego Junior Golf Association. ActivePDF’s continued support and sponsorships have collectively raised over $1.5M in the last 12 months. Recent charity events include Getzlaf Golf Shootout Benefiting CureDuchenne, Warriors With Hope, and Charley Hoffman Foundation. For more information about the Charley Hoffman Foundation or to donate to their supported charities, visit CharleyHoffman.com. To learn more about ActivePDF sponsorships, visit ActivePDF.com/Sponsorships. The Charley Hoffman Foundation was created by PGA TOUR® professional Charley Hoffman and his wife Stacy in 2009 to raise funds for charities benefiting children in their native and adopted hometowns of San Diego and Las Vegas. After several years of successfully hosting the Charley Hoffman Pro-Am with the San Diego Junior Golf Association, Charley and Stacy realized they had an incredible opportunity to further their giving by establishing their own Foundation. A talented and dedicated group of people have been appointed to the Foundation’s Board of Directors, including trusted family members and friends who share the desire to provide a positive environment for children through education, sports, and health. For more information, please visit – CharleyHoffman.com. ACTIVEPDF and the ActivePDF Logo are registered trademarks of ActivePDF, Inc. All other trademarks are property of their respective owners.